Mandolinquents lunch at Starbotton, Upper Wharfedale. With Hilary James at Goderich Celtic Roots Festival, Canada. Trying Breedlove mandolins (rather nice) with Richard Collins. With Eddie Walker and Steve Tilston. Getting down home with Hilary James and Cloé Giraudo. Trading a few licks with American guitar ace Steve Kaufman. The Two Sisters, Hilary James and Janet Giraudo, ski style consultants. Who's that playing my mandolin? Meanwhile, Hilary gets to grips with Meiko's shamisen. On stage in Catania, Sicily. Taking up two seats...! The mandobass is firmly strapped in for passenger safety. An enjoyable workshop with the Mandolin Orchestra of Devon. 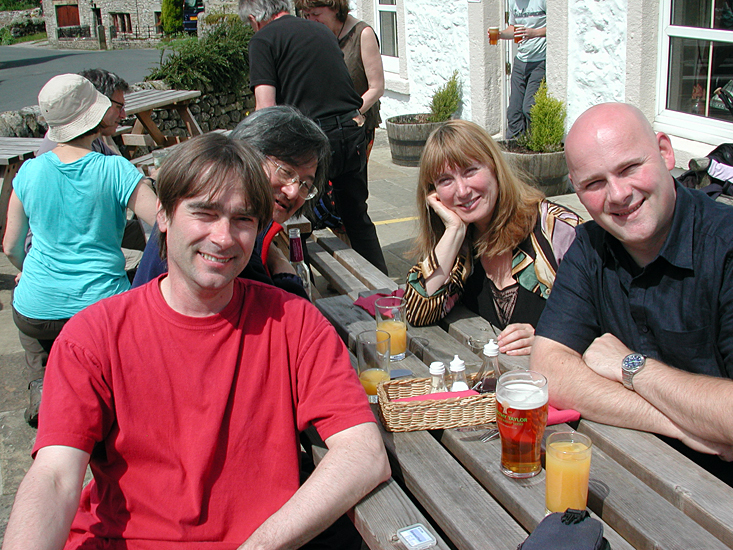 Hilary James with Nigel Gatherer and Maurice Manning. Mustn't get in the way of that magnificent Gaudi archtecture! I only went south for the light, and to buy that shirt. Cloé Giraudo recording her show-stealing vocal for the 'bonus track' on Songs & Chansons by The Two Sisters. Grimaud, Provence. The meal was simple and magnificent. In their spare time, The Mandolinquents have 'Spinal' moments. As planks of wood with magnets go, this was a rather nice bass guitar. At Phil Nixon's shop 'Bassgear', in Twyford, Berkshire. On BBC's Zingzillas. Never realised there was that much jungle in Salford! The Two Sisters: Hilary James & Janet Giraudo. It was never going to replace the mandolin, but it's not every day you get the opportunity to try a shamisen (thank you Meiko). Mandolinquents at sound check (and lighting check). Hilary James and Janet Giraudo at one of their chateaux, not far from Droitwich. Hilary James & Simon Mayor.